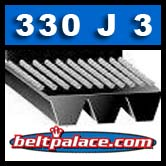 330J3 Poly-V (Micro-V) Belt | Strapack Belt 0810-152308 | 33” Length (838mm), 3 Ribs. Metric 3- PJ838 Belt. Home > Heavy Duty V Belts > Poly-V Ribbed (Micro -V) Belts > J, PJ Section Poly-V (Micro V) Belts - 3/32" Rib Width. > 330J2 Poly-V Belt, Metric 2-PJ838 Motor Belt. > 330J9 Poly-V Belt, Metric 9-PJ838 Motor Belt. > 330J3 Poly-V (Micro-V) Belt. Strapack Part 0810-152308. 330J3 Poly-V (Micro-V) Belt, Strapack Part 0810-152308. 330J3 Poly-V (Micro-V) Belt. Sold as single belt. 33” Length (838mm), 3 Ribs. Metric 3- PJ838 Belt. Various (Non-industrial grade) Chinese brand 330J3. Strapack Part 0810-152308. 330J-3 Used on the RQ-8 and others.